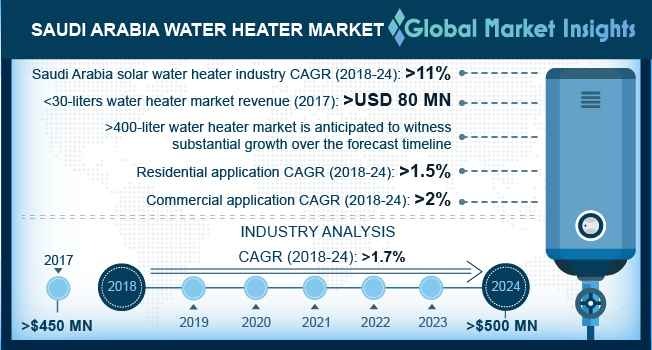 Saudi Arabia Water Heater Market size will exceed USD 500 Million by 2024, as reported in the latest study by Global Market Insights, Inc. Ongoing rapid urbanization and prolific expansion in the construction sector will stimulate the Saudi Arabia water heater market size. The industry growth is facilitated by burgeoning population, infrastructure and economic development and modernization in the country. The government of Saudi Arabia as part of its economic growth plan has announced multiple construction megaprojects which intrurn will create significant deployment prospects for water heaters in the country. Saudi Arabia commercial water heater market will witness growth on account of the expanding tourism and hospitality sector. The country is one of the largest tourist destinations across the GCC region on account of its religious significance. Increasing number of hotels and other luxury complexes, to cater to the mounting tourism needs will accelerate the deployment of these products. Mecca, one of the most populous cities in Saudi Arabia will continue to remain as a sweet spot for investment. Saudi Arabia solar water heater market is set to witness robust growth on account of the country’s tremendous solar potential and favorable geographic location. The country exhibits high levels of solar radiation with an average radiation of over 2400 kWh/m2 per year. In addition, introduction of several renewable energy initiatives aimed at economy diversification & environmental protection will further support the industry growth. Residential water heater market is projected to expand over 1.5 % by 2024. The industry expansion is attributed to transitioning family structure, expanding population base, increasing consumer spending along with the flourishing housing construction. For instance, the Saudi Ministry of Housing (MOH), in 2018, introduced a strategic housing venture to expand the country’s housing ownership to 70 percent by 2030, which will further complement the industry outlook. The <30-liters water heater market, in 2017 was valued over USD 80 Million. These products find predominant applications across residential establishments owing to their compactness of size and affordable price index. In addition, shifting trends toward energy-efficient consumer products reinforced by rising levels of disposable income will support the penetration of these units. Introduction of legislative mandates and standards to reinforce the sustainability levels in the building and energy sectors will propel the Saudi Arabia water heater market growth. For instance, the country has adopted a comprehensive building energy efficiency code, developed by SEEC in collaboration with the American Society of Heating, Refrigerating and Air Conditioning Engineers (ASHRAE). The ability of water heaters to offer high efficiency and meet environmental compliances will significantly boost their adoption across the industry landscape. Key industry participants operating in the Saudi Arabia water heater market comprise Bosch, Bradford White, Vaillant, A.O. Smith, Saudi Ceramics, Rheem Manufacturing, Ariston, Rinnai, Ferroli, Viessmann amongst others.